Ceremonial Change of guards take place at many places around the world.Almost all of them I understand are colorful military drills, enjoyable to all, while I have seen myself some of them.Similarly Beating Retreat is a ceremony that calls patrolling units back to their bases.At different but few locations we have beating retreats at the borders of different countries but the most exciting, eventful, colorful one in the present world is undoubtedly at Wagah border between India and Pakistan. As the sun sets each day, the soldiers of both countries march, trying to outdo the other side in style and perfection. The respective steel gates are opened at the same speed, at the same time- in a haste I would say.The two flags are lowered simultaneously , then folded and the ceremony ends with a quick unfriendly handshake between the soldiers. What makes this ceremony stand out is peoples participation on the Indian side. Singing and dancing of performing Indian youth- men and women alike- to the tunes of old patriotic songs, with occasional loud chanting of 'Bharat Mata Ki Jai'(victory for Mother India) and 'Vande Matharam'(Mother, I bow to thee), while the whole spectators in thousands from all over India including oldies like me, join them waving the tri color flags is a rare emotional experience I have gone through in such contexts.One of its kind among all beating retreats or change of guards anywhere in the world, I would say. Come what may - peak of summer, icy winter or torrential rains-the event rather a ritual is taking place at the dot of time every day without much interruptions ever since 1959!No wonder international tourists also witness and enjoy this event in large numbers. It took some time and skill even for Jaspal Singh, seasoned Punjabi driver of our exclusive Tempo Traveler to come out of unruly and commotive traffic of Amritsar town, like any other typical town of India for that matter, to join the Grand Trunk(GT) Road. Jaspal had been driving us -four elderly couples who are close friends,around the hilly terrain for the earlier week from Chandigarh-Shimla-Kullu-Manali-Amritsar with stop overs as required.Though we reached Amritsar previous night, my mind was not fully awake from the hang over of the beautiful snow clad mountains of Manali. However the name Grand Trunk Road brought me an avalanche of thoughts silently.The GT road is not only one of the longest and oldest roads-over 2000 years old,2500 kilometers long in India but remains a life line all these years.And it passes through Bangladesh,Pakistan and Afghanistan as well.Right from the days of Chandra Gupta Maurya,Genghis Khan, Alexander the Great,Mughals,Shershah Suri.....GT Road remained mute witness to making of this country.It is 28 kilometers to the border from Amritsar on the Indian side while it is 24 kilometers from the border to Lahore on the Pakistan side. 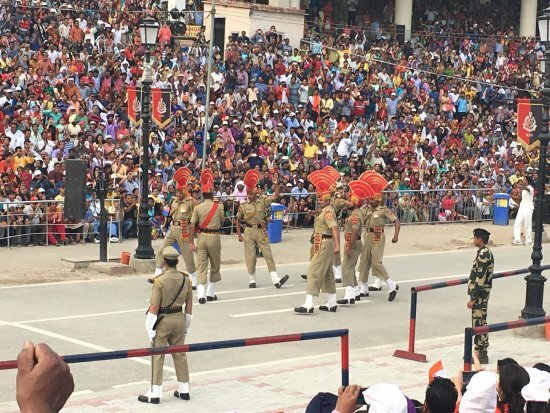 In fact Wagah is in Pakistan now where as the closest Indian village to the border is Attari. I dont know why but 'Zoaq' came to my mind when I read the board which named Lahore. Zoaq is a Pakistani restaurant in Doha owned by a friend of mine Ahmed.About 8 years back it was opened with handpicked chefs brought from Lahore,I remember him telling me. The venture was an instant hit. It remains very popular to date because of the quality of its food-various authentic Lahori dishes. Soon we reached the border- known as Radcliffe line in the world history. India and Pakistan celebrated independence in 1947 without knowing their own boundries! I am sure that most of us may not know much about how literally the partitioning process was completed by Britain between India and Pakistan in 1947.Sir Cyril Radcliffe was appointed as Chairman of Border Commissions - one for Punjab and the other Bengal.Though there are 4 members in the commissions, two each representing Indian National Congress and Muslim League, the decision making power remained with Radcliffe. Interestingly Radcliffe who was a lawyer did not know India at all or never visited the country even once prior to the appointment.In hindsight I think the British authorities wanted such a person for the job! He came to India on 8 July 1947.More or less within a month he completed his job! !Simple as that! !But his decisions were kept as secret for a week until published.Officially Pakistan was born on 14 August 1947 while India on the next day- 15 August 1947.But both countries celebrated independence without knowing their own boundaries! !Hardly few know that on the very same day Radcliffe left India for good after handing over the award to last Viceroy! On 16 August at 5.00 PM Indian and Pakistani authorities were given advance copies of the final details of the border while it was officially published on the very next day with no room for changes.Riots and killings on both sides had started earlier to that, before Radcliffe left India. Finally, above a million people were killed while another 12 million people were uprooted from their homes! !No one knows exact figures.History books say that Radcliffe never collected his fee of Rs. 40000 which was offered on his appointment.It seems he was appalled by the killings that he left in a hurry.He knew what would follow if his own boundary line is implemented!! After 70 years since both countries got independence, when one look back I am of the opinion that it was a blessing in disguise for India.Two undisputed factors lead for this thought.One India has become a fully matured democratic country.Second India would not have achieved the way it has progressed economically and otherwise for the last 20 years or so, if it was one country. People can differ with me,I know. As we are about to reach the border for the ceremony, all the vehicles were stopped for security reasons except those who are having VIP entry passes issued by Border Security Force(BSF).All others have to walk almost a kilometer.Thanks to Manohar a colleague of mine who took the efforts to get those passes for us , we could reach the venue or view the ceremony without any difficulty.For others too it is stream lined well, I have noticed but one has to walk a bit and probably has to come early as well to get a seat.But it is amazing that everything is being done absolutely free by BSF. We sat in the well laid out amphitheater made of concrete meant for the viewers on the Indian side.The heat was generous since the setting sun was directly falling on our faces.Nevertheless our spirits were lifted as a crowd of ladies- young and old- came to the center stage and started singing and dancing to the tunes of patriotic songs.Moments one may feel emotionally.Being abroad I was missing this all these years! 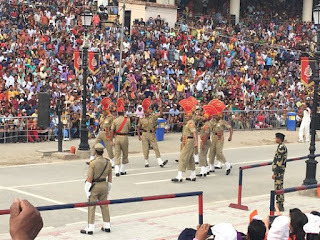 This was followed by parades of well built BSF soldiers who are in khaki uniforms, starched and pressed, with colorful orange fanned hats.All the time they were making heavy foot stomping or goose steps which will keep one on the edge of the chair.Definitely they must have been well trained.As some part of the ceremony synchronized in time and actions with Pakistani side I think it can never happen so unless both countries cooperated. As Indigo Airlines took off from Amritsar airport the next day noon to take us back home, my mind was full of Golden temple, the show at the border and 'alu parantha'( a bread dish stuffed with mixture of mashed potato and spices) offered by Ramada for breakfast.